I have a confession. Some of you might already know this. Wait for it…I am not a real blogger. Far from. I read and follow real bloggers, like Katie from sassandbalderdash (my fave) and I’m nothing like them. I just enjoying making fun of things and people and spit it out like I would say it. No frills, no gimmicks. A real blogger cares about how their blogs look, how their widgets, whatever that is, stand out on their page. A real blogger spends time creating the perfect blog aimed at getting maximum read. I don’t really give two hoots. I just write the damn things that come to my crazy head. I make no apologies. You like it or you hate it. If you sometimes come across some misspelled words, I apologize as I take my spelling very seriously. If I mangle the Queen’s English and make a mockery of the language, it’s mostly intentional. If it’s not, I just failed to proofread. If my blog goes on and on, I am not sorry, that’s how I get when I’m excited and can’t wait to spit it out. It all comes out a bubbling verbal mass. Ala verbal diarrhea. So you see, I am not a bonafide blogger. I don’t have a target audience, do I even have an audience? I don’t have a regular schedule. Do I have a schedule to talk about anything I want to talk about? I regret to inform you that I am not a real blogger. I don’t really regret but that’s the proper way of saying it. Follow me at your own peril but don’t expect anything from me that only real bloggers can deliver. 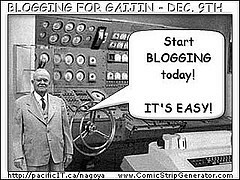 This entry was posted in Blogs, Humor, Writing and tagged Blog, Funny, Humor, Life, Wordpress, Writing by The egg man. Bookmark the permalink.